ROSSS is the first company in its field in Italy to have achieved the ISO 9001 quality certification. ROSSS is also certified in the topic of Social Responsibility (SA 8000), Environment (ISO 14000 and EMAS). ROSSS products are ACAI CISI certified. All steels used by ROSSS are free from radioactive contamination, in accordance with the provisions of the Legislative Decree N ° 230 17/03/95. 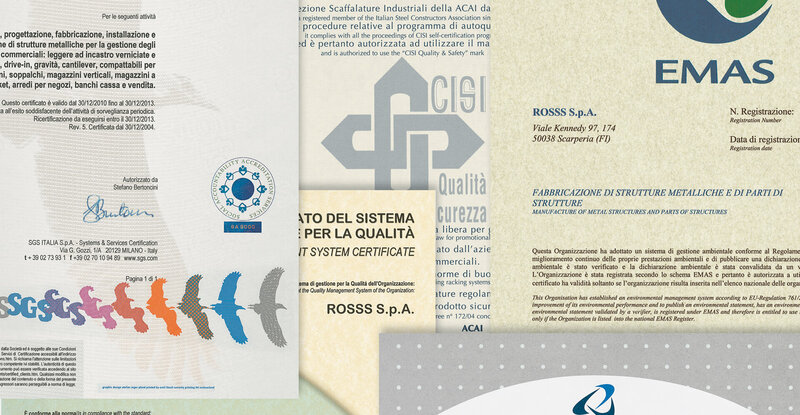 ACAI has given the brand “CISI Quality and Safety” to ROSSS S.p.A., that has demonstrated full compliance with the regulations in the “Self-Qualification Rules”, as well as certifying the quality of the product for design, realization and security aspects. Today AISEM has met inside the best national entrepreneurship for the construction incorporating the section Shelf CISI in addition to the section of machinery for handling and lifting of materials. Certificate of quality management system. The Quality System certification was obtained in 1996 (first company in the shelving sector), according to the worldwide recognized standard UNI EN ISO 9001, which guarantees the quality of a company in the design, development, manufacturing installation and after-sales service aspects. Certificate of environmental management system. ROSSS was the first company in the metal shelving industry to obtainy the ISO 14001 certification. The ISO 14001 certification guarantees that ROSSS operates in full respect of the environment always having considered it one of the basic variables in defining business strategies. The Emas Community registration was achieved in 2004 (first company in the sector 28.11 “”Manufacture of metal structures and parts of structures””). With this registration, in addition to the provisions for the ISO 14001 environmental certification, the environmental performances of the company are made public, and therefore transparent (as Rosss usually is) with the publication of the “”Environmental Declaration”” which contains: a description of activities and the impact that they have on the environment, the report of the results obtained by the company in pursuit of better environmental performance, including the objectives and programmes defined for the future. ROSSS is the first even in the ethical certification. Child labour, forced labour, discrimination: terrible words, that in every business, in Italy and in the world, and in any industry, we do not even want to hear. For this ROSSS is the first Italian company to have been certified SA8000 ethics in shelving industry. So that it is clearly written, and certified, that our company rejects such practices. So that it is clear that ROSSS, expects that its products whether they are made internally or by suppliers, have to be produced in full respect of the people working to create them. Because we believe that quality means, first of all, respect. The industrial shelving are very special metal constructions, realized with thin cold-formed profiles, continuously perforated, connected with hook systems which are different from manufacturer to manufacturer. Thus, although the general rules for the design are based on the principles and Eurocode 3 (part 1-1 and part 1-3) formulations, more specific guidance should be provided to take account of the instability of these particular profiles to appropriately determine the design parameters through experimental tests. The outcome of the studies, experiments and analysis made in recent years has led to the publication of EN 15512 for the designing of pallet racks. ROSSS SPA is the first company to obtain the UNI EN 16681 certification (Steel static storage systems – Pallet rack – Principles for anti-seismic design) on the entire Pallet rack range. The certification was issued by TUV SUD starting from July 2017. TUV SUD inspectors and specialists have confirmed the correct application of the UNI EN 16681 standard in every aspect, production and design, recognizing the excellence of our product.